After making the Zuni ricotta gnocchi with browned butter and sage, I had a bunch of leftover fresh sage. I could've made another savory dish, but then I spotted Tartelette's post for rosemary and apricot shortbread cookies, which in turn, were based on Better Homes and Garden's apricot-sage cookies. 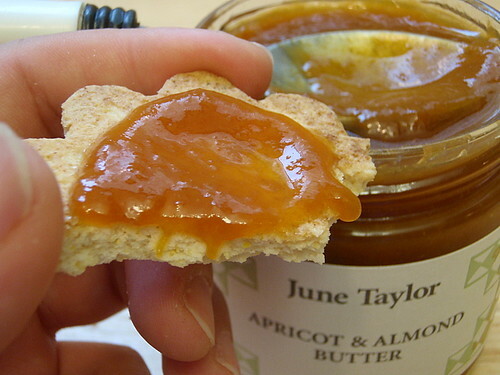 This was quite serendipitous because I was actually looking for a way to use up this most wonderful apricot & almond butter I had bought from the Ferry Building Farmer's Market when I had visited SF a couple of weeks ago. This stuff is out of this world. As in when I had my first taste, my eyes lit up just like Jonathan's did when he tasted the honey in 1 Samuel 14. That's right, it's Bible-quoting good. I'd been hogging it all to myself, just smearing some on whole wheat toast and eating that for breakfast, second breakfast, elevensies, etc. But I realized it deserved to be showcased and shared. 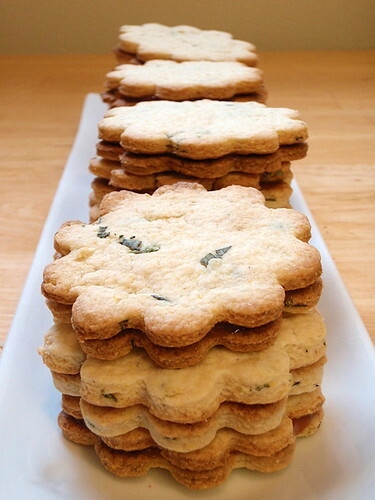 And sage shortbread cookies sounded like a pretty good way to do that. Preheat oven to 375 °F. In a bowl stir together flour, sugar, and cornmeal. Cut in butter until mixture resembles fine crumbs (I used a fork for this). Stir in sage. Add milk. Stir with fork to combine; form into ball. Knead until smooth; divide in half. On lightly floured surface, roll half the dough at a time to 1/4-inch thickness. 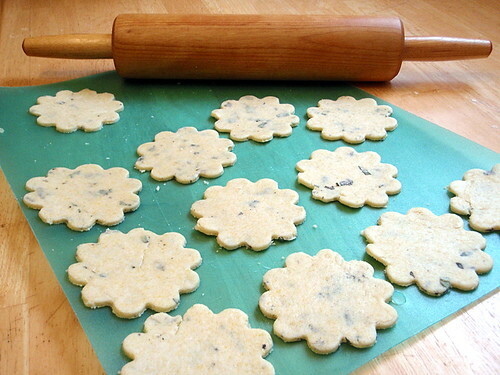 Using 2-inch round cookie cutter, cut out dough. Place cutouts 1 inch apart on ungreased cookie sheet. Bake about 10 minutes or until edges are firm and bottoms are very lightly browned. Transfer cookies to wire rack. Cool. Spread bottoms of half the cookies with spreadable fruit. Top with remaining cookies. To store: Place in layers separated by waxed paper in an airtight container; cover. Store at room temperature up to 3 days. Or freeze unfilled cookies up to 3 months. Thaw cookies; fill with spreadable fruit. Unfortunately, I discovered that the apricot & almond butter wasn't really viscous enough to be used in a sandwich cookie; it kept smooshing out the sides when you bit into the cookie. And interestingly enough, I could barely taste the sage, although almost all my friends who tried it immediately commented on the savoriness of the cookies. Personally, I probably would've added some salt to the cookie mix or sprinkled some sea salt on top of the cookies right before baking them. wow, sage... that's really interesting. very cool.